Many people think that southern Arizona is a land of only harsh deserts. But the region is hardly a desert in the traditional sense of the word. In fact, this part of Arizona has a wealth of habitats, from dry deserts to tawny grasslands to lush pine forests, and many more in between. 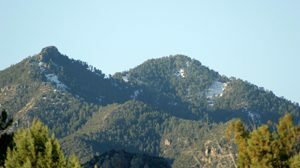 The Chiricahua Mountains of far southeastern Arizona are the single largest range in the state, rising from 3,000-foot desert and grassland plains to 9,796 feet at its highest point, Chiricahua Peak, and stretching 40 miles long by 20 miles wide. On the western side of the range the Sonoran Desert laps at the foothills; this is also the location of Chiricahua National Monument. On the eastern side of the range are vast plains of Chihuahuan desert and grassland. The range itself sits in a chain or “archipelago” of mountains that link the Rocky Mountains of the U.S. and Canada with the Sierra Madre Occidental in Mexico. Thus, the Chiricahuas are a crossroads for 4 distinct ecological regions–two deserts and two mountain chains. Download the Notes of a military reconnaissance by Lieutenant William H. Emory. Learn more about Emory here and here. In 1864 J. Ross Browne travelled through “the Purchase” with Charles Poston. He recounts their journey in Adventures in the Apache Country. Also available are A Campaign against the Apaches by Lieutenant Marion Maus and Lawton’s Pursuit of Geronimo by Leonard Wood. Click here to see the complete list of the free e-books currently available. If you do not have the Microsoft e-book reader, you can download it free from the Microsoft website. Articles on the Coronado Expedition, Father Kino, the Terrenate presidio, the Buffalo Soldiers, Fort Huachuca, Faraway Ranch, the Stafford Cabin and old Tombstone give a glimpse of the fascinating history of this little piece of the world, called by some the Bermuda triangle of wild west history, because so much happened in such a small space.